If you ask Dawn, she might say, they are "Dedicated to dogs and the people who love them!" 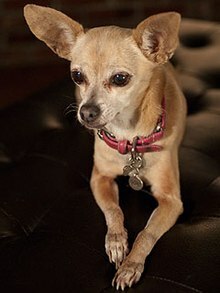 Gidget (born Gidget Chipperton) – made famous with the "Yo Quiero Taco Bell" campaign passed away from a stroke on July 21, 2009 at the age of 15 (in human years). Before he passed, he wrote his memoirs, wherein he commented on the future for dogs. See the excerpt below. "Some day dogs will evolve and take over the planet, and then the humans will be kept as pets." He was well known for his hot latin temper. In other instances he wrote about his deep affection for his owner. He often spoke of how close he felt to her, especially when she would pick him up so he didn’t have to walk through deep mud puddles, while not drawing attention to how tiny he was. And she didn't punish him when he would have accidents in the middle of the night with his age advancing and health declining. And in another instance, he wrote about an incident that "defined their relationship," as he put it, where he spoke about how grateful he was when his owner saved him from what would have been a certain death, narrowly escaping being eaten by a large german shepard. There were actually three dogs who played the part, the 1st "Dinky" quickly replaced by the 2nd "Gidget" who became the real star, and the third "Taco" who was a backup stand-in for Gidget. Before Gidget passed, he wished them well and spoke about how he hoped there was no animosity between them, with each competing for the same role. He was concerned people wouldn't understand that he was much more complicated than the celebrity dog people only saw on television. He will be missed. Special Message: Let your dog know how much you care with some Blue Cerebus Dog Cookies. And bring your dog to the shop with you. Dog treats or People eats? You Decide! You’ll have to come down here and try the Blue Cerebus taste test and decide for yourself. Thank you, Lord, for giving me the human people that I see. The ones who hug & hold me tight, and shares their bed with me at night! Wet Nose Always Welcome! The Blue Cerebus Dog Boutique offers incredible gourmet treats (we sell 1,000 cookies a week! ), tough and fun toys (over 15 with a money back guarantee), stylish collars and leads, plush beds, groovy dog bowls, and so much more. We have our Kiki Puppy Park that is open Spring, Summer and Fall. The Blue Cerebus is open 7 days a week and we are the one and only dog boutique in downtown Madison. Join our Cookie club, Birthday club and Santa Paws club today! Brands we carry: Himalayan Dog Chews, Antlerz, Up Country, West Paw, Planet Dog, Doggles, Petfly, Chilly Dog, Wacky Walkr', Thundershirt, Aroma Paws, Cain & Able, Happytails, Honest Kitchen, Evangers, Castor & Pollux, Earthborn, Merrick, Wellness, Darford, Natural Planet Organic, Petcurean, Tiki, Tuffy, Harry Barker, and so much more. Ok, that’s a quick overview of TBC, I could put so much more, but thought that was alot. Please call me if there are any questions. fun toys, Harry Barker dog beds, art & cards, baseball caps, tote bags, & so much more! Visit their official and very cute web site here.